Congrats to Coach Jack Alexander for his age group win and 13th overall at Best of the Best Triathlon on Sunday, November 5, 2017. Jack reports the ride was tough with brisk 20 mph winds. Jack finished with an overall time of 1:17:15.8. His splits were 3:28 swim; 47:27 bike (20.2 mph) and 24:11 (7:48 per mile pace). For more on results, go to: runsignup.com. 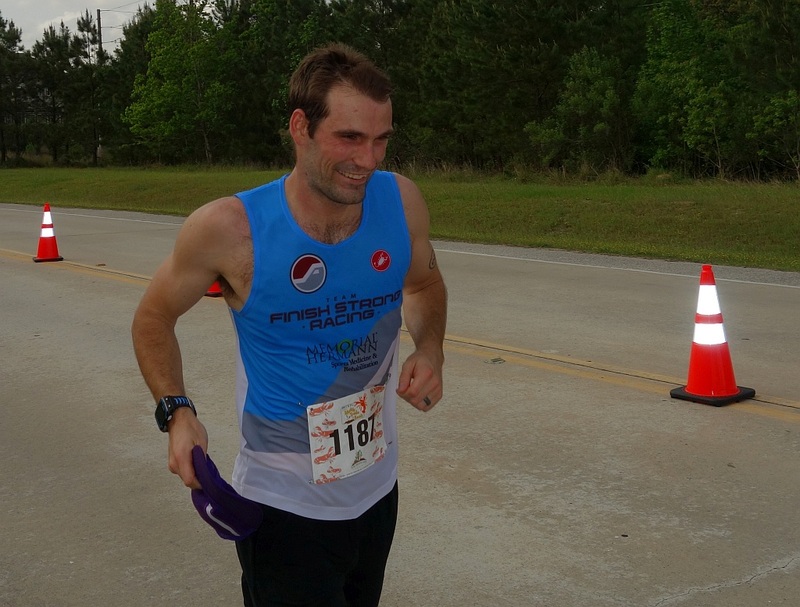 Finish Strong Racing had a great showing at the Fairfield Tri and Du held on Sunday, October 22 in Cypress, Texas. In the triathlon, Alan Jones won the male masters, Phillip Deprang won male grandmasters, Keith Sacchieri won his age group, Byron Moore, Andreas Grossman and Pia Grossman all took 3rd in their AGs, and Joe Tokarz finished 4th in his AG. In the duathlon, Julio Morales finished 2nd in his AG and Gordon Irving finished 1st in his AG! Our SelecTRI youth team member, Jackson Reed, won his 14 and under division in the Aquabike. Congrats to all! Team FSR was well represented at Tri Aggieland on Sunday, July 9 in College Station by John McGowan and Amie Quinn. John finished in 1:16:23. Amie finished in 1:15:50 and was awarded was 3rd place in her Age Group. Tri Aggieland was a 400 meter pool swim, 12 mile bike ride, and 5k race. Congrats! Despite choppy waters, Finish Strong Racing team had a good day at the Sylvan Beach Sprint Triathlon/Duathlon on Sunday, June 11. It was a 500 yard swim, 15 mile bike, and 3 mile run. FSR’s Byron Moore took first place (Clydesdales), Pam Meaux and Yves Puisieux both took 1st (Duathlon 55-59) and Mark Hanlon first place (Triathlon 55-59). Scott Peterson also got 10th overall and 3rd Triathlon 35-39. FSR’s Rodrigo and Manuel Abascal, Cheryl Perry and Nick Crafton also had nice tri races. In the duathlon, Pam was joined by teammates Yves Puisieux, Gordon Irving and Julio Morales. Our SelecTRI youth also did great – Chase Cieslar took 1st and Luca Menendez took 3rd in under 14 in the sprint triathlon. Finish Strong Racing team members were well represented with 57 competitors and 30+ volunteers at the 14th annual CBI TRI – The Woodlands Sprint Distance Triathlon held on Saturday, May 6, 2017. This year’s race served as the Texas State Triathlon Championship. Scott Peterson competed as an elite and came in 5th among the elites. Podium finishers from Finish Strong included: Zach Miller who won his 25-29 age group and came in 2nd overall among groupers. Dale Claudel finished 5th overall and 2nd in his competitive 45-49 AG. Mark Hanlon won his AG and Jim Harrington and Phillip DePrang took 3rd in their respective AGs. Byron Moore took 1st in the 30-39 Clydesdale Division. For the women, Sarah Moore won her AG and Chantal Requier took 2nd in her AG. Kristen Gohlke and Drew Nichols each took 4th in their age groups. See below for race results. Congrats to all! Claudel Dale 1:01 2nd in 45-49 AG 5th overall! Miller Zach :58 1st in 25-29 AG 2nd overall! Finish Strong’s Mark Hanlon was on top of the podium in New Orleans at the Draft Legal Sprint Triathlon Worlds Qualifier on Saturday, November 5th. Unfortunately because of strong winds, the swim was replaced with a 5k run, then a 20k bike, and the 5k run at the end was changed to 2.5k. Mark reports, “This is the 3rd time this year that my swim was canceled. I was pleased with my race, placing first out of 21 in the 55-59 age group, so now I will probably do both the Olympic and Sprint distance in the ITU World Championships in Rotterdam, Netherlands next September.” Way to go Mark! Finish Strong Racing and our SelecTRI youth and juniors had a good showing at this weekend’s Fairfield Sprint Tri and Du on Sunday, October 23. SelecTRI’s McKenzie Gunter won her 14 and under AG in 1:02:36 and Chase Cieslar took 2nd for the male under 14 age group in 1:03:25. Chase beat his dad, Mark, who placed 5th in the 55-59 AG in 1:12:23. Finish Strong was represented in the sprint race by Byron Moore who won the male Clydesdale category in 1:03:02. Ivonne Vandanam who clinched 5th in her 40-44 AG; Joseph Tokarz who took 7th in his 45-49 AG in 1:09:38; Willie Ramos who finished 20th in the same AG in 1:17:51. In the duathlon race, Julio Morales and Gordon Irving both won their AGs. Julio came in 1st for the 40-44 in 1:07:38 and Gordon finished 1st in the 45-49 AG in 1:08:13. Congrats to all! Byron, Willie, Ivonne, and Joe rocked the sprint tri for Finish Strong! Podium finishes by Kenzie Gunter 1st in under 14 female and Chase Cieslar 2nd in under 14 male AG! 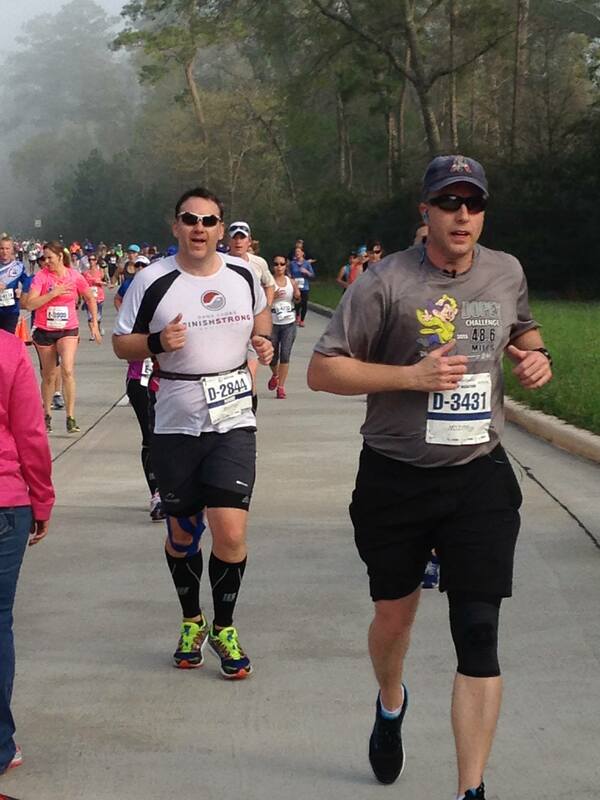 Another great race weekend for Finish Strong Racing! Jack Alexander, Zach Miller, Alan Jones, and Pam Meaux all raced at Try Andy’s Tri held in Sugarland, TX on October 16. Zach placed 4th among the elites in 46:39. Alan placed 2nd in his AG in 52:30; Pam placed 2nd in her AG in 1:06:26; and Coach Jack Alexander took 1st in his AG in 52:07. From our SelecTRI Youth and Junior Team – Chase Cieslar won his 14 and under AG in 54:59. His dad, Mark, also raced. Congrats to all! Alan Jones (center) takes 2nd in AG at Try Andy’s Tri! 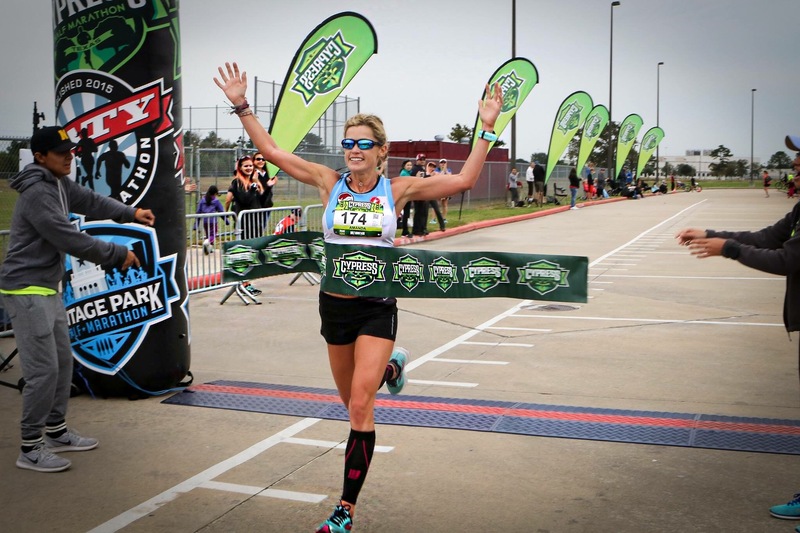 Finish Strong Racing members competed in both the Olympic and Sprint distance Oktoberfest Tri held on October 9 in Fulshear, Texas. Competing in the sprint race were Karen Goodwin, Christy Gonzales, Kimberly Bryant, Shannon Vultaggio and Willie Ramos. Karen Goodwin took 1st in her 45-49 AG in 1:36:06. Christy took 3rd in 1:36:33 and Kim 5th 1:44:14 in their 40-44 AG. Shannon finished in 1:42:38 – 6th in her 35-39 AG. Willie finished with a personal best in 1:52:00. In the Olympic distance race, the team was represented well by Mark Hanlon and Ivonne Vandanam. Mark placed 4th in his AG and 60th overall with time of 2:31:38. Ivonne Vandanam finished in 3:18:54 – 8th in her AG. Congrats to all! Karen, Christy, Shannon and Ivonne got it done!